Post CAT results the race to join the elite B School has begun. 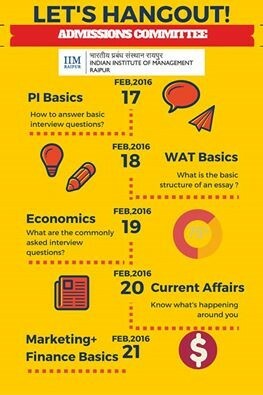 Most of the IIM’s are organizing sessions to help aspirants crack the WAT/PI round efficiently. IIM Raipur has been doing this for a couple of years now. This year the Admissions Committee of IIM Raipur is organizing a series of Hangout sessions on various themes and topics to help the aspirants. The Hangout week began on 17-02-2015 and will continue till 21-02-2016. The response has been great till now and we expect even more in the upcoming sessions. The next session is on Economics, followed by Current Affairs and Marketing /Finance.